A stunning natural event is occurring right now in Richardson Bay, one that many had feared would never happen again. Tens of thousands of herring are spawning, releasing millions of roe (eggs). These little fish are hosting an entourage of feasting seabirds and other marine life. Bouncing back from a historically low population just four years ago, the SF herring run has returned in full force. It has drawn the attention of countless seabirds and marine mammals, and has reignited the human fishery. 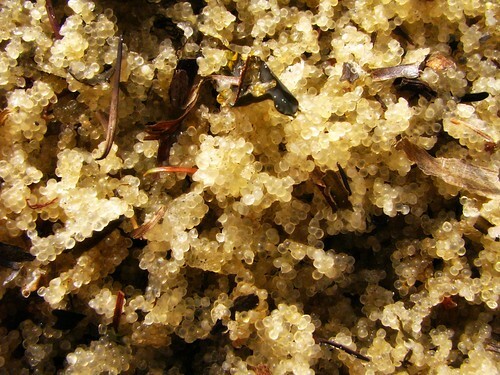 Herring roe covers the shorelines of Richardson Bay, feeding thousands of seabirds. Image courtesy of Flickr User bee wolf ray. Walking along the shores of Richardson Bay, one would run into a horde of biologists and birders, binoculars in hand, observing the spectacle taking place above the waters of the inlet. Protected on one side by Sausalito, on the other by Tiburon, Richardson Bay offers a protected cove where herring can spawn. The waters are teeming with herring, and masses of roe litter the rocks and sand of the shoreline, providing a fine banquet for a host of feathered guests. At last count, over 21,000 birds were hot on the tails of the herring run. Flying, swimming, diving, squawking – it is a feathered circus happening right in our watery backyard. Spectators gather to gawk at the immense number of common birds, while birders sit for hours searching for the rare ones. It is an exciting and beautiful event to behold, whether you are a bird fanatic or simply a lucky passerby. Herring are a crucial food source for California’s marine creatures. They provide seabirds with the needed nutrition for extensive migrations. Sea lions, seals, porpoises, dolphins, and even whales feed off of the herring. When such forage fish are depleted, the evidence of marine life suffering is obvious. Emaciated sea lions litter the beaches of California and fewer seabirds can be seen nesting along our shores. The entire food web suffers an upheaval and can have numerous unintended consequences. The population began a decline back in the early 1990s and crashed by 2009 to a historically low biomass of 4,800 tons. Overfishing was mainly to blame, but there was also a curiously warm ocean at the time – most likely due to the El Niño Southern Oscillation that year – that created a less than ideal ocean environment for the fish. The herring have apparently had plenty of time to recover; scientists estimate that there is now close 80,000 tons roiling under the Golden Gate Bridge and into the bay. The San Francisco herring run is the last urban fishery in the United States. It’s the only major fishing operation where an audience can sit ashore and watch the boats pull in their catch. Herring were once collected mainly for their roe, with demand high for sushi preparation. But that is changing. Local San Francisco Bay residents are discovering that we have a taste for the little fish and consumers are seeking out the tasty herring fillets. They are low on the food chain, so there is little to no concern over mercury. They share many of the same health benefits of anchovy. Whether grilled or baked, poached or pan-fried, herring makes a delicious healthy meal for breakfast, lunch, or dinner. The reemergence of the little fish means more money for the local fishing economy. The quota this year is 3,700 tons, a mere 4.6% of the herring in the bay. That is still quite the catch, worth about $15 million. Fishermen have reason to celebrate, especially with a recent scarcity of anchovies and sardines. The fishermen do, however, have to wrestle with the birds for a piece of the catch. The population rebound is a testament to proper management and policy. We witnessed the collapse and total closure of the fishery just four years ago. Once the population was deemed to be healthy again, the CA Department of Fish and Wildlife has only allowed a catch of less than 5% of the total biomass of the population – a sustainable rate that still brings in a substantial income for the fishermen. This has lent to the fantastic rebound of the population. With a healthy population and the money rolling in, a commercial herring permit will become very appealing for fishermen who would otherwise focus on a different catch. Once the competition between boats begins to increase, the catch rate of 4.6% will not supply fishermen with the desired income and it is likely they will begin to demand a higher catch rate. Maintaining this rate is essential – in 2009 we saw that the herring populations are sensitive to ocean conditions. Herring are one of the few fish populations that Fish & Wildlife survey every year because their recruitment (survival to adulthood) is so variable. This variability, in turn, makes them especially vulnerable to fishing pressures. A 5% catch rate one year could yield 4,000 tons, the next year it may only be 2,000. The fact that herring are back at a healthy 80,000 ton biomass this year and that we have a sustainable fishing rate does not ensure that the fishery will not collapse again. Watching the birds feast on the smorgasbord, it is easy to believe that the fishery is fine, the animals are healthy, and all is right with the natural world. But if there are over 20,000 birds feeding on the herring and their roe inside the bay, there is most likely over 70,000 feeding on them along the coastline outside the bay. Additionally, there is a multitude of marine mammals and other sea life that are gorging themselves offshore. On top of all of this, the herring run supports a commercial fishery for humans. It’s a lot of pressure to put on a little fish, even one as resilient as the herring. We witnessed their collapse once before and we will again if we become complacent. It is the last commercial fishery that takes place inside San Francisco Bay; all the others have ended due to overfishing, pollution and invasive species. With the proper management of the herring fishery, we can ensure that this last urban fishery remains for many years to come. It is essential that permits are limited, the catch rate remains steady, and populations assessments continue each and every year. Herring, perhaps more so than other wild-caught fish, are vulnerable. It is not a lesson that we want to forget. Pucci Foods recognizes the importance of protecting our resources. Contact us today to learn more. » Tobacco to the Rescue- Will this Controversial Product Help Save Two Industries?